Tampere, Finland, November 3rd 2017 – The wordgame and role playing game mashup Spellspire by 10tons Ltd. will become available for Nintendo Switch™ on November 9th. The game is priced $9.99 USD. 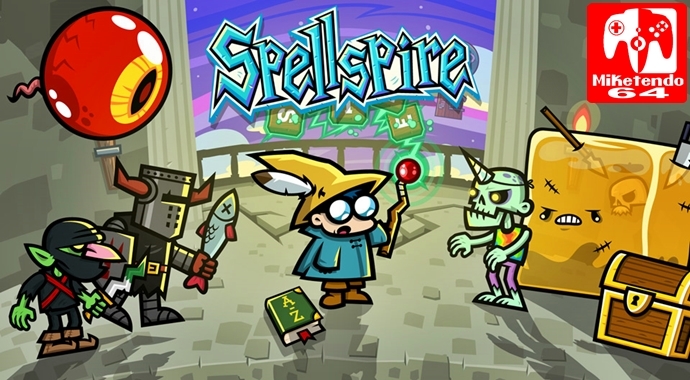 “Spellspire is a charming combination of a word game puzzle and action role playing game. It’s wonderfully simple to pick up and play, with just the right amount of action role playing game tropes to liven things up.” says Tero Alatalo, CEO of 10tons Ltd.
Spellspire casts the player in the role of a nerdy wizard climbing a 100 level tower. Plenty of monsters must be defeated and loot collected on the way. Combat uses a word game mechanic, where the player picks letters from a grid of ten letters to spell words. Words are cast out as spells, with longer words producing more powerful blasts. In between levels the player upgrades the wizard’s gear in role-playing game fashion. Exciting mashup of word game and action role playing game. Pick letters to spell words. Collect gold and buy better items between levels. Use consumable magical items to push through tough encounters.